I can't believe how much I learned from one DVD. This video packs in the information (although it does move a bit fast at times). Far superior to the last bartending video I watched. Even if I never start bartending, at least I won't ask anymore dumb questions at the bar. GREAT VIDEO. Fifteen years ago, the athletic club I belonged to opened a beer and wine bar and I was offered a job as bartender. Little did I know that first shift would change my life. Overnight, I went from retail sales of office products making a minimal wage to pulling in $200 cash in a six-hour shift. I even remember standing outside the bar that night thinking, How did I miss this for so long? I knew I wanted to serve liquor and enrolled in a two-week bartending school (more about that later). With-in six months, I was bartending at a busy hotel in downtown Atlanta, making great money with full-benefits. I even had travel benefits to stay for free in hotels around the world and a flexible schedule so I could enjoy it. Since then, Ive worked everything from sporting events, live music shows, theater events, weddings and private parties. Ive worked in fine dining restaurants and high volume nightclubs and my guests have ranged from Bjorn Borg to Garth Brooks. Ive had a chance to travel extensively, complete my college education, meet great people and have a lot of fun. In this video, I'll share with you the lessons I've learned over the years. Whether you're just interested in the world of bartending or about to take your first step to a new career, I believe you will find this the most complete and accurate bartending video available. Who is the 90 minute Bartending School for? This is a complete bartending school designed for anyone ready to learn professional bartending. teaching your policies and drinks, not reviewing the basics. (contact us about discounts for multiple copies of the video). Home Entertainers - If you are improving your bar knowledge around the house and want to entertain with style, you'll find the basic proceedures and combinations to begin inventing your own drinks. You'll also love the signature drinks that will add spice to any party. The 90-minute bartending school is a complete bartending course. It is a full ninty minutes of visual demonstrations that you can watch over and over in the comfort of your home. Be careful of bartending schools that offer a certification. Regardless of what they want you to believe NO CERTIFICATION is needed or desired as a bartender. Presenting a certification to a potential employee only demonstrates how green you are. Want proof? Go talk to five of your favorite bartenders about bartending school and certifications. They will tell you the same thing. Bartending is learned by practice. Many states, however, do require an alcohol awareness class. This is entirely different from a class teaching bartending skills and drink recipes. If your state requires this class, your employer will generally send you AFTER you get a job. Again, this is NOT a certification and is NOT available through bartending school. NO CERTIFICATION IS REQUIRED to begin bartending. Bartending School is the right choice for some people. If you have the extra money and need someone to motivate you to practice, attend a bartending school (stay away from the online bartending schools unless you have the extra money to blow). If you want to save a few hundred dollars and gain a more well-rounded education, then the 90-minute bartending school is the clear choice. The video includes all the visual demonstrations, practice techniques, and factual information you will get in a bartending school, plus tricks, techniques and memorization tips that can only be learned by the combined 50+ years of experience behind this video. And, its yours to keep and continue to learn from. 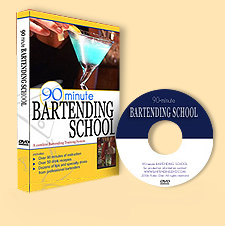 The 90-minute Bartending School is the most accurate and complete bartending video available. Filled with visual demonstrations you can only get from a video, the 90-minute Bartending School picks up where the books left off. Get ready for an entertaining, feature-length film - that will teach you to bartending like a professional. Great video, I am training as a bartender and it gave me the confidence to get behind the bar!" Hello I am currently twenty years old and when I turn 21 this December I plan on becoming a bartender. I have purchased many books and DVDs on the subject most of which give a basic overview of how the bar is set up different types of liquors and liqueurs. But if you are actually planning to become a bartender this 90 minute Bartending School DVD gave me the most information about the profession. It goes deeper than any other DVD out there in terms of what the customer expects and how to act behind a bar. I have watched it many times over and still learn things each time through. The 90 minutes were quick paced and the different segments went seamlessly together. The bartenders in this DVD were fun and (if this makes sense) more real than the majority of actors in the many other DVDs. This DVD really helped my practicing and I hope it helps you too! Quick but very informative without being intimidating. Very highly recommended for a professional or just someone who wants to look professional when throwing parties! I am 54 and have worked as a bartender since I was 21. I purchased your video as a present for a young friend who has been asking me to teach him to bartend. I wanted to watch the lessons before giving him to him and found myself getting a great refresher course and learned some new tricks! You should produce other DVDs showing how to mix other drinks. I'm confident those of us in the business would appreciate it. "Well produced and informative. Very fast delivery and well packaged." This is a great product, you'll learn the basics don't think your going to walk in and get a bartending gig after viewing this. It's a great starting point. This video is great for the novice wanting to learn more about the bartending profession. It covers the basics anyone who serves alcohol should know up to tips on how to be proficient and how to make the proper drink. This video should be in the library of any restaurant that serves alcohol it is a great learning tool. An inexpensive, informative resource for learning all the skills to start bartending. Every time I watch it I learn something new. Content very helpful and informative. Did the job. This is the sort of video I like to learn from, moves fast, lots of examples. Not just one instructor but 10 instructors. Organization is clean and easy to follow. Very complete. An excellent DVD.. i was very happy with its information. So clear and so precise.. I am very happy.. I am glad I bought it.. thank you.. I learned about drinks and cocktails I knew exist but didn't know how to prepare them.. but now I do.. thank you.. SINCERELY: A happy customer..
Great video. Thanks for the tip on rolling the lemon to make a twist. I just started bartending and learned a lot. I've watched the video over and over. Im writing to tell you I just got a job as a bartender. I am in college and have been looking for a bartending job to make extra money. After watching the 90 Minute Bartending School video I felt a lot more comfortable in the interview and knew answers to the questions I was asked. I start next week and Ive been studying like crazy. I really cant thank you enough. You sell a great product. The best one ...I bought others and yours is the best.!!!! I've been bartending and bar managing for nearly 20 years and this is the BEST teaching tool you'll ever find on the subject. The "courses" and "certification programs" offered by schools and online associations are for people who want to waste their time and have too much money to spend. This video is all you need. WOW!!! **** Excellent Item. Highly Recommended. CA Super helpful. Great video. Lots of information. Much more interesting and fun to watch than your typical training video. Instead of one instructor droning on, this video cut back and forth between a knowledgeable host and other charismatic bartenders. They all offered useful and insightful tips. This video is packed full of information, but it is well organized, so it dosen't get overwhelming. I wasn't looking for a bartending job, just some tips on how to serve stylish, unique drinks at my own parties. This video delivered that and more. It will now be more fun to be a customer at my favorite bars, knowing more about the drinks and what to ask for. Fast Delivery and Video is Good Quality. Not Cheesy Like I was worried about.